A beautiful set of Victorian taxidermy dik dik horns by R Katzer of Cape Town, South Africa. A tiny & very unusual piece of early antique taxidermy with a wonderful look about it. 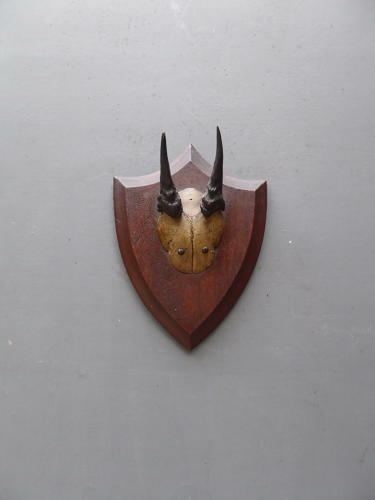 The small, perfectly formed horns & skull cap are mounted on a solid mahogany shield with the original makers label to the rear & the whole piece had a beautiful age related patina. Wear commensurate with age as pictured, very good overall with one small chip to the tip of the left horn.